A versatile sweet and sour side dish! I don’t know about you, but I’m craving a little heat and a lot of sunshine on my plates these days. A meal at Vancouver’s exceedingly popular Ahn & Chi restaurant was the inspiration for this bright, flavourful recipe. I think folks line up down Main Street every night there for more than just the fantastic mango salad, as every dish I’ve tasted on my two visits was spectacularly delicious. For this recipe, lightly pickling the mango and vegetables softens their texture and eliminates some of the daikon’s natural bitterness. Soaking the red onion in a cold water and baking soda mixture serves to moderate the harshness that is typical of raw onion – it’s a method I’ve used for a long time and it works really well. You could add julienned seedless cucumber to this dish if you like. This salad is best enjoyed as soon as it’s made but will keep in the fridge for up to 24 hours. 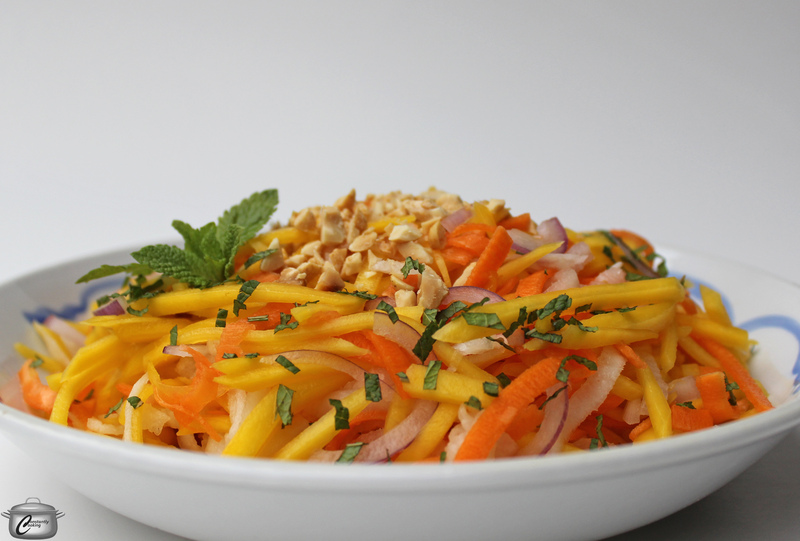 Put the prepared mango, carrot and daikon in a shallow, broad dish. Make the pickling solution by stirring together the rice vinegar, water and white sugar in a small bowl. Drizzle the brine over the mango mixture and toss gently. Cover and refrigerate for one hour, tossing occasionally. While the mango, carrots and daikon rest in the brine, combine the cold water and baking soda in a small bowl and stir to dissolve. Add the red onion and stir. Let sit 15 minutes, stirring occasionally, then drain and rinse onions well under cold, running water. Dry on paper towel. Also while the mango mixture is pickling, in a small jar with a tight lid, combine fish sauce, sugars, water, lime juice and finely minced chiles. Cover and shake to blend well and dissolve sugars. Drain mango mixture well, discarding brine. Transfer mango and vegetables to a serving bowl. Drizzle with dressing and toss. Sprinkle peanuts and mint on top and serve immediately. 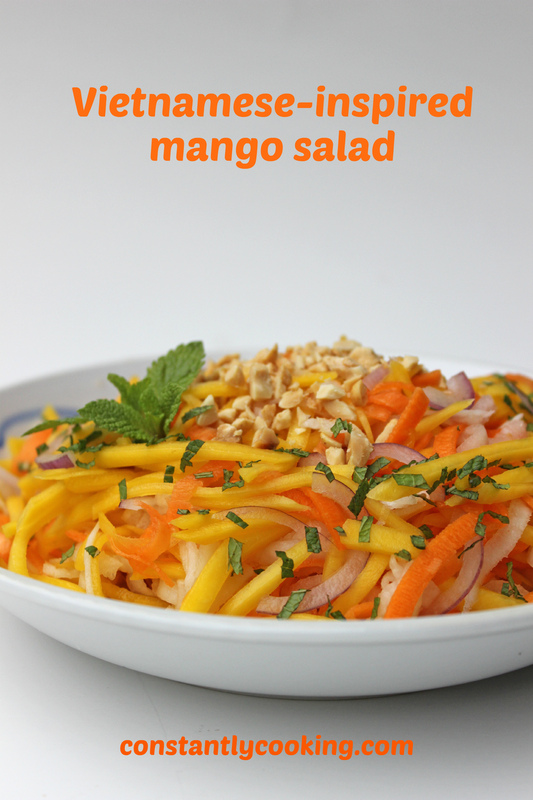 This entry was posted in Salads and tagged Asian, carrot, daikon, fish sauce, fruit, lime, mango, Paula Roy, radish, raw, salad, sweet-sour, vegan, vegetable, vegetarian, Vietnamese, what to serve with asian food. Bookmark the permalink.